This is book two in a six-book series on fundamental mathematics for adult learners. These books include glossaries, self tests, practice requests, grades records, and unit tests. Ancillary Resources include the Instructor's Manual. 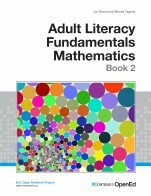 Adult Literacy Fundamentals Mathematics: Book 2 by Wendy Tagami, Liz Girard is licensed under a Creative Commons Attribution 4.0 International License, except where otherwise noted.